Pennsylvania's current flag design was officially adopted in 1907, and now uses the same blue as the flag of the United States of America. 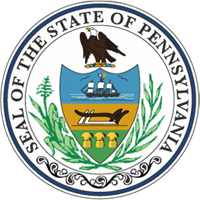 The centered coat of arms (from 1777) sits on that blue field, and contains the official seal of the William Penn family, the founding family of Pennsylvania. That seal is flanked by two draft horses (in black), and contains a ship, plow and sheaves of wheat. A bald eagle sits at its top. The draped ribbon at the bottoms reads: "Virtue, Liberty and Independence," the state's motto.